Miner Bruce, the author of Alaska — Its History and Resources, Gold Fields, Routes and Scenery, first went to Alaska in 1899 and was impressed by its future possibilities. 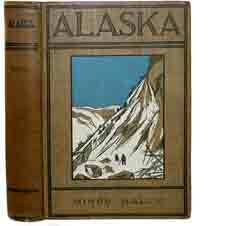 At the time, interest in Alaska –- particularly the Klondike -– was widespread because of the discovery of gold there. Bruce ’s advice was not to go unless ready to face the privations of a pioneer life. The book contains fabulous old photographs, including one of twin Eskimo sisters, and a series of fold-out maps detailing the various Klondike gold fields.